With this ice cube tray with lid, no more drips on the floor or in your freezer. Snap on the lid and add water through the hinged single opening. Lid keeps out fridge odors for clean, fresh-tasting ice. Covered ice tray is dishwasher-safe plastic. 11 3/4" L x 4 1/4" W x 1 1/2" H.
I actually not only bought for myself, but my daughter as well. The lid prevents spillage from the sink to the freezer! LIf you refrig has no iced maker - this is a MUST. These leave no mess and are easy to neatly stack in the freezer! I've used mine for several years now and it doesn't break or lose the flap or anything. No complaints! Yeah, it's gotten a little swaybacked over time but the lid still fits well so I don't care. It keeps my ice cubes from getting evaporated by the automatic-defrost of my freezer. An open tray's cubes will disappear if I don't use them soon enough. In this thing, the cubes are always there even in winter when they are left a while. I'm ordering another one today - I use ice faster when Indiana is hot and humid! Love the non spill tray!! I love being able to walk across my big kitchen without any spills!! The covered ice cube tray keeps ice from evaporating. This is a handy product and keeps ice cubes fresh. Also excellent if you have small freezer and need to stack items. I would not be able to recommend buying from Miles Kimball though since I found the same product for the same price that gave TWO trays instead of one. I will be buying another set from that source. We love this ice cube tray! Sturdy lid prevents spillage, and the tray is a real space saver in the freezer. Highly recommended! Great ice trays and cheaper than other brands that do the same thing. This ice cube tray with lid is the best. I really like these! With the fridge away from the sink I was always dripping water across the kitchen. Now I make one less mess to clean up! I cook 3 meals and 2 snacks 7 days a week. I have used the trays for diet soda treat cubes. I have also used for chicken soup storage when you just need a small amount. I am ordering more for the 3rd time. They close well, and do not spill. A must for the every day chef. Give your kids a treat and do juice-smashed bananas etc. It was either find a covered ice tray or buy a new refrigerator. These trays make a wonderful pure ice not contaminated by freezer smells. Then we ust empty them into a covered container for future use. These ice cube trays solved my problem. I have a freezer door that slides out and I would constantly spill water when using the conventional trays. These have eliminated that. Great product! I have a balance problem and have to hold on to a sturdy surface with one hand. This product allows me to make ice cubes and put them in the freezer with out spilling the water. Love it! I LOVE THESE AS THEY DON'T SPILL!!! NICE TIGHT FITTING LIDS. Gave as a gift and was appreciated. Love this ice tray it fills good and is easy to use. Seems to work really well. Haven't used it long enough yet, however. THIS PRODUCT IS GREAT BECAUSE OF THE LID. After releasing icecubes from tray, I put the lid back on, turn it upside down, and the cubes stay put while I pick them up to place in a water bottle or glass. The lid snaps on securely and fits snug but comes off easily even when frozen. 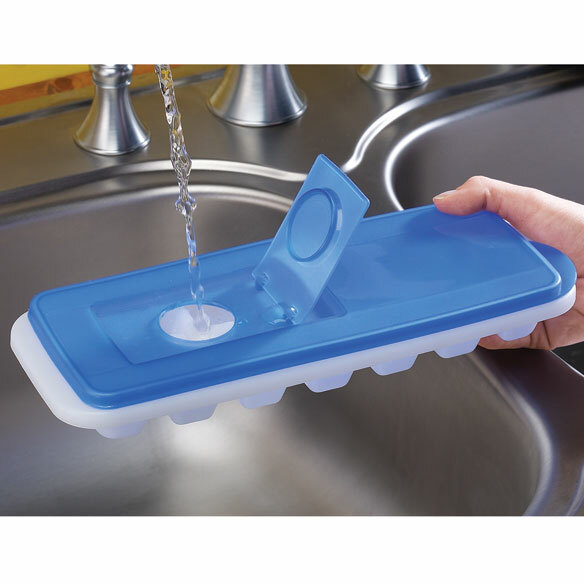 A great product that solves the annoying problem of water spills from ice cube trays! I use this product for ice cubes. I got tired of buying ice when I can make ice in the comfort of my own home. I love the fact that this product can be stacked on top of each other, not using alot of space in my freezer. I bought one of these trays as a test for use in our motorhome. It worked fine, so I've just ordered two more. I like it much better than the ice cube trays sold in camping stores, which produce tiny cubes and are awkward to use. I am buying four more of these for my sailboat.....I first only bought two to see if they work. They are perfect! The seal is very good, so the water stays in. This was my primary concern, because on a boat the water in an ordinary ice cube tray would slosh around and spill. I love the ice cube tray. I put in the ice box. It,s the best Ice tray. Great Idea, Great Product. Ordered several last year but lost them to my adult kids. I love this product so much that I ordered 5 more just to keep in stock or to use at gatherings. Plan to order more. Great doesnt spill when walking to freezer to put in icecube tray. No more nasty tasting ice! These ice cube trays are GREAT cause nothing gets into the ice and the cubes come out crystal clear, doesnt make the beverages taste nasty with freezer burnt ice cubes. these trays keeps ice fresh . This ice cube tray allows for efficient use of freezer space and prevents odors in the ice. I am glad I've finally purchased this product and highly recommend this to others. I'm tired of ice trays that are open to the freezer smells and anything dropping into the cubes. This should be mandatory! It keeps the ice from spilling over and getting bad taste..
Have been searching for covered ice trays for ages. I was very pleased to find them at an affordable price. The ice stays odor free! I now make coffee ice cubes so I can make my own iced coffee I use milk chocolate or caramel syrup stir and add the coffee cubes. A lot cheaper than buying it. I put the cubes after frozen in a freezer bag. LOVE, Love.Love it. Stackable. Sealable. Won't leave a trail of water from the sink to the freezer. great space saver in my crowded freezer-keeps ice fresh and odor free-can stack them and put stuff on top without spilling freshly filled water. Love These Covered Ice Cube Trays! I ordered these trays for myself, and have enjoyed using them so much that I ordered more to give my daughters-in-law. The flat lid makes it nice for stacking. It dosen't spill. Great idea, but the bottom is not level, so you can't fill to the ends from the fill hole. I really like them but wish they were not warped on the bottom. Would be great for making and storing homemade baby food. Sturdy and love the cover. Ice cubes won't get that freezer taste. I can make ice without spilling water on the way to the freezer, or all over the freezer while putting it in the freezer. Yes, I would purchase this product again. It does exactly as it was advertised. These ice cube trays are good.. no drip, keeps ice fresher and cleaner... and easy to stack . I ordered two ice cube trays, then two more. No more water spilled on the floor or into the freezer, and cubes are easier to get out. However, the tabs that are supposed to help open the top cracked and broke off leaving sharp edges/points. Don't bother with the tabs on the top lid, or make them thicker. Now we have ice cubes again! Love the first one so I ordered another, will probably order more. These trays works well in my freezer. It works well, no complaints at this time. these seem to be a relatively budget friendly alternative to the similar looking product from rubbermaid. i'm happy with them so far. It is unique and so far it works very well. Should come in sets of two! We bought six of these about a year ago and one of the lids has completely fallen apart (really - like into six separate pieces) and two others are broken in half. Cubes are smaller than expected. The cover is productive. Cubes are small. VERY HANDY - TOO HIGHLY PRICED. how do you know when the water is all filled in there ? And why can't you just fill the water with the top off ? There are no instructions...I am throwing it out. How do you get the ice out? I don't know what others are raving about, but these trays don't bend or twist at all, so how are you to remove the ice? My Ice Cube Tray arrived with the tray bent, preventing the cover from covering it adequately. I've tried twisting the tray to make it straight but with little success. Disappointing. I have two more of these. They're great. requires little space in freezer and the cover will keep out the freezer odors. to keep other item out of the ice. Easy to use. No drips or spills on the way to the freezer !! I am a klutz and never make it to the freezer with the water left in the tray. This should stop that. Getting ordinary trays filled and to the freezer was a challenge without spilling. I thought I would try these. It can also be used to freeze individual stock or even flavored cubes and they stack nicely. Keep cubes fresh, easy fill, no spill !!!!!! I was looking for ice tray like this. Because I’m tired of removing ice from the bottom of my freezer. I NEED MORE ICE TRAY'S ONLY HAVE 1 PLUS MY CAT AND ME LOVE ICE WATER. My disable aunt will be able to use without spilling liquid. I hope it works well for her. Because all the ice cube trays I buy in the stores break shortly after I start using them. I'm hoping these are better. Ice maker no longer works but the refrigerator is like new, so I now am using 2 of these and decided to get 2 more. So my 86 year old Mom can fill them without spilling...and if they tip over in the freezer it won't spill. So I won't spill it on way to the freezer! Using tray for frozen treats; didn't want odour from other frozen goods to infiltrate. it is better than the one with no lid..at least my ice will not evaporate ! I want to use this to make flavored ice to use in my smoothies. What size are cubes and how many can be made with ONE ice cube tray? BEST ANSWER: Thank you for your question. You can make 14 ice cubes, standard size. We hope this information will be of help to you. BEST ANSWER: That's a great question! I'd like to know too. I'm sorry, but I have no idea. That's a question for the manufacturer or maybe Easy Comforts can find out. I've had this item for awhile and the packaging is gone. If I remember correctly there was very minimal packaging. Just plastic covering the tray. Thank you for your question. Yes this is BPA free. We hope this information will be of help to you.